Orange has announced its new Recycle and Reward scheme to help consumers unlock the hidden cash in their ageing, useless gadgets. 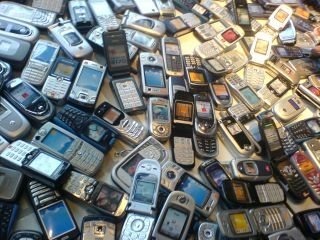 Orange is claiming that the UK has approximately £450 million worth of unused and decaying mobile phones just sitting around, and wants to help those users make a little money. Similar in style to the likes of Envirofone, with Recycle and Reward consumers can take their old laptops, mobiles and MP3 players to any UK Orange Store, and will receive the money in the form of a cheque in the next week. Those that are part of the Orange's Care program can also get a free Copy and Keep service, where all important media on the device is stored for them before the device is sent for recycling. For those not on the Care program, and unwilling to do it themselves, the service costs £6. Orange is claiming this is an important service as 38 per cent don't back up content simply because they don't know how to, while 25 per cent just forget. "At Orange, we've made some significant strides recently in reducing the environmental impact of our business," said Paul French, head of care products for Orange. "For instance, 80 per cent of our electricity now comes from renewable sources while in July we introduced the mini-SIM to reduce the amount of waste associated with new SIM cards. Recycle & Reward is just another small step, for us as a business and for the public, in our journey towards greener, more sustainable practices."